Emily P. Freeman — host of one of my favorite podcasts, The Next Right Thing, has a book coming out in April titled (you guessed it!) The Next Right Thing. 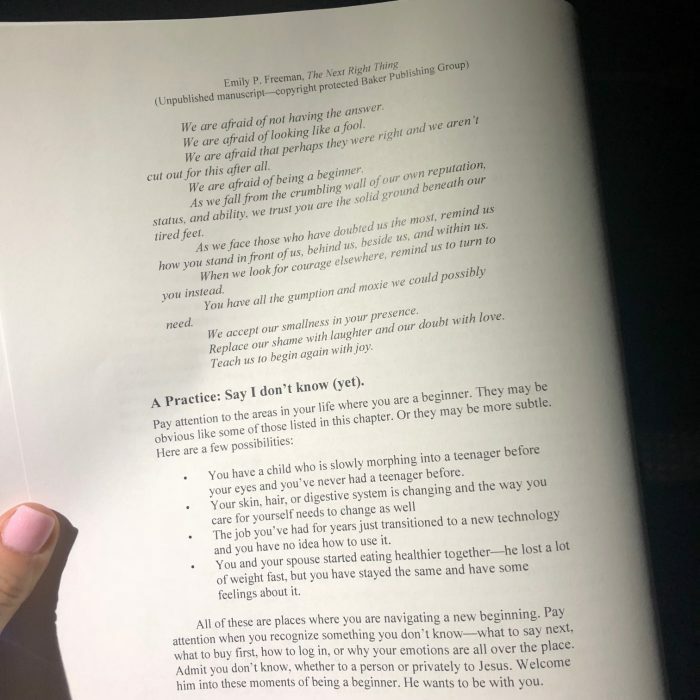 I got to read a pre-release copy of her book on my flight to Wichita and back this weekend and I really enjoyed it and underlined many different quotes. 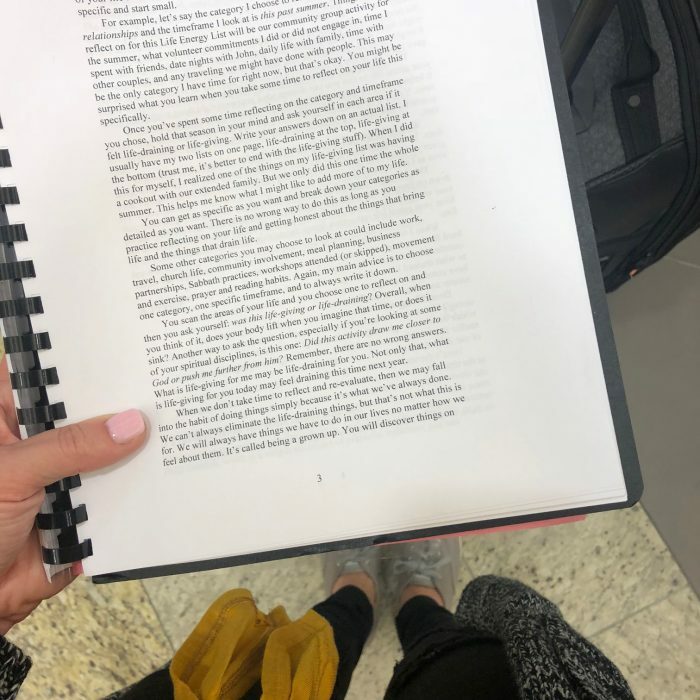 If you are a listener of her podcast there is a lot of overlap between the content, but it was so wonderful to read it in book form and to be reminded of so many of the valuable words of truth in it. The Next Right Thing is a book you can go back to again and again and each time it will hit you in a new and fresh way. Each short chapter is heartfelt, thoughtful, powerful, and impactful… and leaves you with intentional but simple action steps to take and insightful questions to help you gain more clarity for right now and for your future. 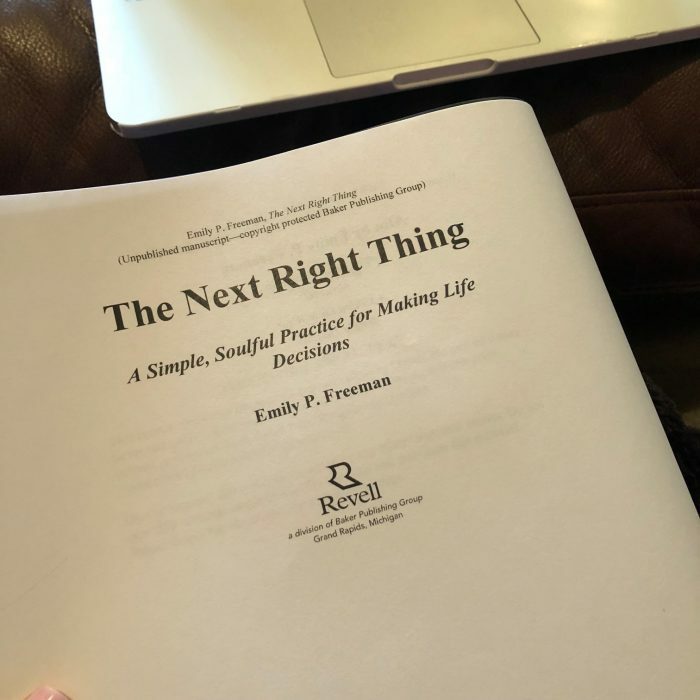 If you struggle to make decisions, you’re in the midst of a big life change, you’d just love some quiet guidance to be more intentional with your days, or you love Emily’s writing and podcast, this book is for you! What did you read this past week? Any books you really think I need to read or watch? « Save on Dove Hair Care at CVS this fall season! then give you a window into a different slice of life and glimpse at a different culture and the ingrained mindsets in that culture). It’s also wonderful on Audiobook. Trevor Noah speaks 6 languages and is amazing at doing all sorts of different accents. I want to — but I heard really negative feedback on it from a friend of mine and now I’m kind of scared to read it. I love ALL of the people in SA — both blacks and whites — and my friend told me that it painted the white South African men in a terrible light and I just didn’t know if I can could stomach reading a book like that since I personally know some incredible white South African men AND black South African men who are working together for change in their country. I had totally planned to read it until I heard that. I’d love any insight you can give on that. Oh interesting, I didn’t get that from the book at all. His father is white and he speaks very highly of him and I think he had several white friends from school who he speaks well of. What he does is critique and analyze apartheid and it’s after-effects on South African society. He makes observations both positive and negative about issues in the white communities, mixed race communities and black communities. But he absolutely isn’t saying all white South Africans are bad. It kind of reminds me of Hillbilly Elegy: he isn’t saying all low income people throw away good paying jobs and then act like they were a victim but it’s a problem he’s observed in te community and needs to be addressed. I think it’s worth the read just to see his mother’s journey of faith and hear the hilarious/heartbreaking story of his dog Fufi. Oh and he has a section about speaking the same language as someone else and how it connects you that is absolutely fascinating. Of course it’s absolutely up to you, but I think it’s one of those books that if you read it, you might not agree with all of it, but I don’t think you would’ve regretted having read it. How did I miss that Emily P. Freeman is writing a new book? So excited to hear this! I listen to her podcast weekly. Thanks for sharing! Just wanted to let you know that I’m loving your podcast and look forward to my Tuesday commute to work. Great job!